MADE to be pushed down supermarket aisles, some shopping trolleys unfortunately find themselves being hurled off bridges all over Australia and the Tweed is no exception. Missing trolleys have long been a problem for supermarkets and a company has recently launched a smart-phone application that uses GPS technology to allow people to report trolley locations. Trolley Tracker managing director Chris Ford told the Daily News that although the company has been around for several years, the application was only launched in May. "People seem to have adapted to it really quickly. More and more people have smart phones and we've been really pleased with the results," Mr Ford said. "The Trolley Tracker app is so effective because it involves no effort on the part of the phone user other than simply activating the app. "They really can see, swipe and go. "Between eight to 10% of the returns are via the app." People who use their phones to report trolley sightings automatically go into a monthly lottery with a chance of winning the $1000 prize. The prize money shies in comparison to the cost of replacing trolleys. A Woolworths spokesperson said that every year the cost to collect and replace lost, stolen and abandoned trolleys amounts to $50 million. 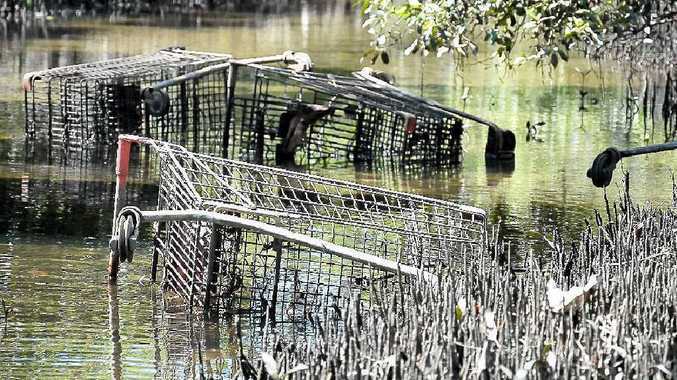 This week the Daily News found seven shopping trolleys in the creek near the skate park at Tweed Heads South. A Tweed Shire Council spokesman said they had a procedure in place for dealing with the problem. "What generally happens is we report it to Trolley Trackers but it's also referred to our works department," the spokesman said. The Trolley Tracker App is available for most smart phones. GPS technology allows users to simply send a precise location. Every month five state-based $1000 lottery prizes are drawn for people who report trolley locations. The annual cost to the retail industry to collect and replace trolleys is thought to be over $200 million. Seven trolleys found this week in a creek in Tweed Heads South. There are thought to be 2 million trolleys in Australia.